Such a sweet little thing. So tiny and perfect from his head to his toes. You can't help touching those tiny wrinkled fingers, squeezing those adorably pudgy arms and legs, and holding him close because he's such a joy to cuddle. No wonder you want him in your arms all the time! 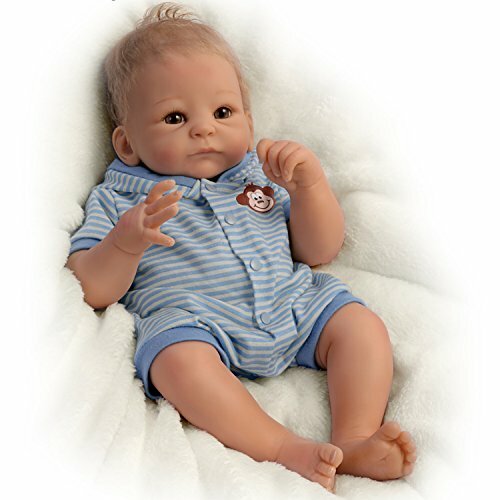 Now, you can cuddle Benjamin, an irresistible lifelike baby doll created by Master Doll Artist Tasha Edenholm, exclusively from The Ashton-Drake Galleries.This sweet as can be So Truly Real® baby doll is handcrafted of RealTouch® vinyl skin and features shy brown eyes and wispy blonde tufts. The precious sweetheart arrives in a darling blue ensemble showcasing a charming monkey friend. Holding his weighted 17 inch body in your arms makes it easy to fall in love over and over again. Strong demand is expected for this lifelike baby doll, and you won't want to miss out. Order now! If you have any questions about this product by The Ashton-Drake Galleries, contact us by completing and submitting the form below. If you are looking for a specif part number, please include it with your message.